Precious Moments were huge when I was little, so when I saw Happy Harvest I just had to have it. Happy Harvest by Jean Fischer is a board book about 5 x 7 in size, which is perfect for little hands. Happy Harvest focuses on the time autumn, basically September, October and November. Each page has a new theme and every other page has a bible verse. For example, when you first open the book, your child will learn how many seasons we have and what we call them followed up with a note on how God made them. The next page will talk about autumn and how we should be excited for it followed with a verse from Ecclesiastes. After those two pages, the book goes in chronological order, starting with the end of summer. Then we move on to September with the start of school. Your child will even learn the Harvesttime Prayer. Throughout Happy Harvest, your child will see how we transition from the end of summer to Thanksgiving. You will learn a few different prayers, ones that a child could easily memorize and recite. Your child will also learn about fall activities like campfires and jumping into a big pile of leaves. Happy Harvest is not your typical board book. Majority of the board books we have at home only have a handful of words on each page. Happy Harvest has a small paragraph or a few sentences on each page so your child is getting many little stories versus one story being told throughout the book. The illustrations are sure to keep your little one engaged while listening to the story. Each page has children doing various activities that coincide with the story. So when you are reading about friends and the start of the school year there are 2 kids with backpacks on walking towards a school bus. 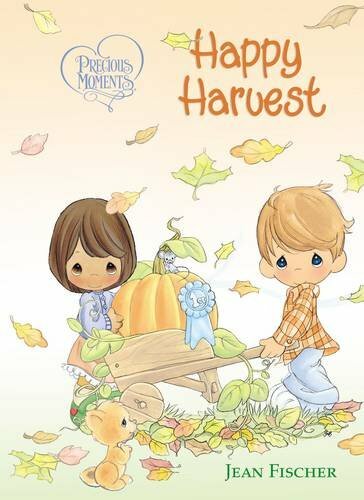 Happy Harvest is a cute book to help kids learn about all the fun traditions and activities the fall brings us with bible verses and prayers sprinkled in. You can purchase your own copy of Precious Moments Happy Harvest on Amazon or your local bookstore starting August 1st.